Without a doubt, the cultivation of Piennolo Cherry Tomato on the slopes of Vesuvius has ancient and well-documented roots. Mentioning only the most famous historical sources, news on this product are given by Bruni in 1858, in its "Degli ortaggi e loro coltivazione presso la città di Napoli", where he talks about very tasty cherry-shaped tomatoes that can be preserved until spring if hung in the lofts. Another reliable literary source is Palmieri who in 1885, in "Annuario della Reale Scuola Superiore d'Agricoltura in Portici" (the current Faculty of Agriculture) talks about the local practice to hang cherry tomatoes in shady and windy places. Francesco De Rosa, another professor teaching in the school of Portici, is the first researcher describing the cultivation method of cherry tomatoes, implying that a whole economy based on this product was developing in the area: from the production of seedlings to the sale of the preserved product. Also prof. Marzio Cozzolino, from the Faculty of Agriculture in Portici, in 1916 agrees with the previous sources both on the variety description and the production methods, describing in detail the cultivation methods and, above all, providing data - also economic data - explaining the complex features of this kind of product. 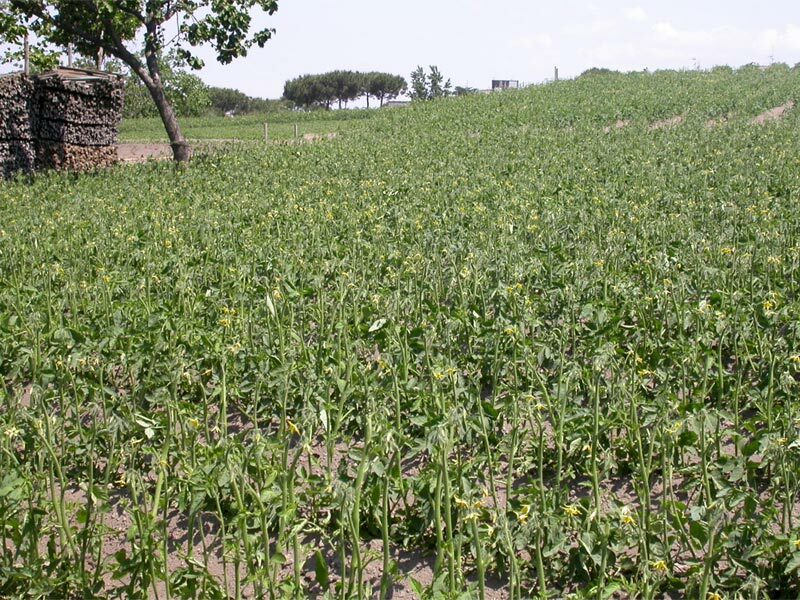 The characteristic production and conservation area of Piennolo Cherry Tomato coincides with the whole area of Somma-Vesuvio volcanic group, including the areas sloping down almost to the sea level. In particular, according to the specifications of Pomodorino del Piennolo del Vesuvio DOP, the production area includes the whole territory of the following Municipalities in the province of Naples: Boscoreale, Boscotrecase, Cercola, Ercolano, Massa Di Somma, Ottaviano, Pollena Trocchia, Portici, Sant'Anastasia, San Giorgio a Cremano, San Giuseppe Vesuviano, San Sebastiano al Vesuvio, Somma Vesuviana, Terzigno, Torre Annunziata, Torre del Greco, Trecase; the part of the territory in the Municipality of Nola delimited by the Park perimeter: from the SP road Piazzola di Nola - Rione Trieste (for the stretch called "Costantinopoli"), from "Lagno Rosario", from the limit of the Municipality of Ottaviano and from the limit of the Municipality of Somma Vesuviana. 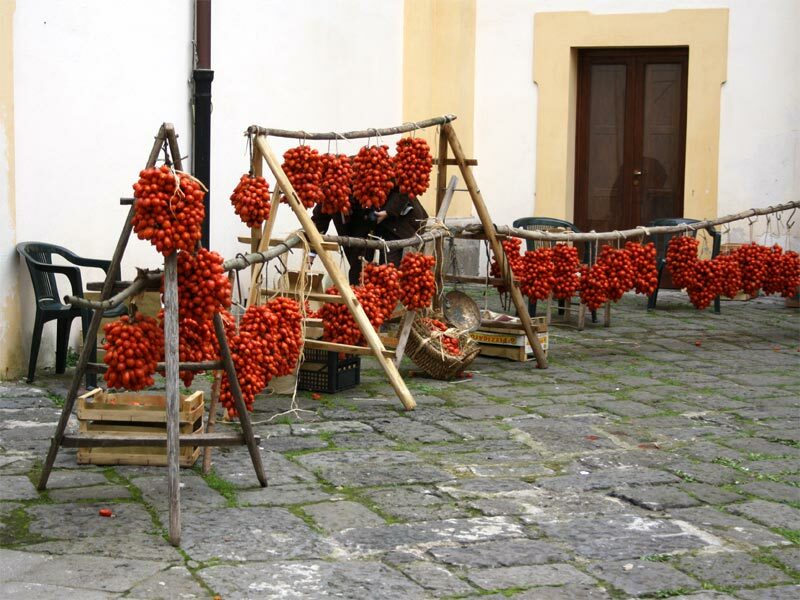 Vesuvius Cherry Tomato is appreciated both when it is sold fresh after harvesting on the local markets and in its characteristic conservation hung-shape - "al piennolo" -, or again as a preserve prepared according to a traditional local recipe and sold in glass jars. 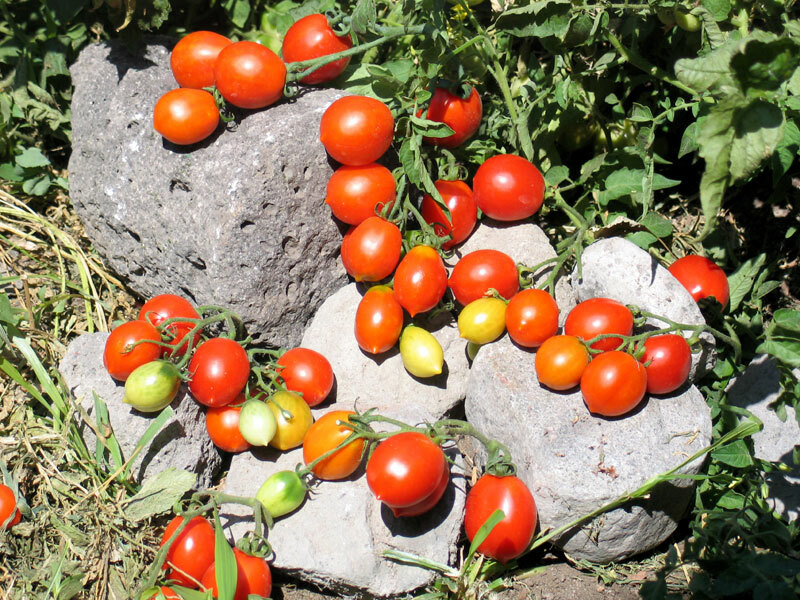 Usually, harvesting is carried out cutting whole clusters when they are formed by at least the 70% of ripe cherry tomatoes, while the remaining part is still ripening. This ancient practice gives the opportunity to preserve the clusters for the whole winter (seven-eight months) in airy premises and without the support of modern conservation technologies. The peculiar features of Pomodorino del Piennolo del Vesuvio DOP are the consistency of the peel, the strong join to the peduncle, the high concentration of sugars, acids, and other soluble solids that make it a long-term conservation product without altering its organoleptic features. Such features are deeply linked to the soil and climatic aspects of the geographical area where the cherry tomato is cultivated, where the soils, of volcanic origin, are formed by pyroclastic material deriving from the eruptions of Somma-Vesuvio volcanic group. 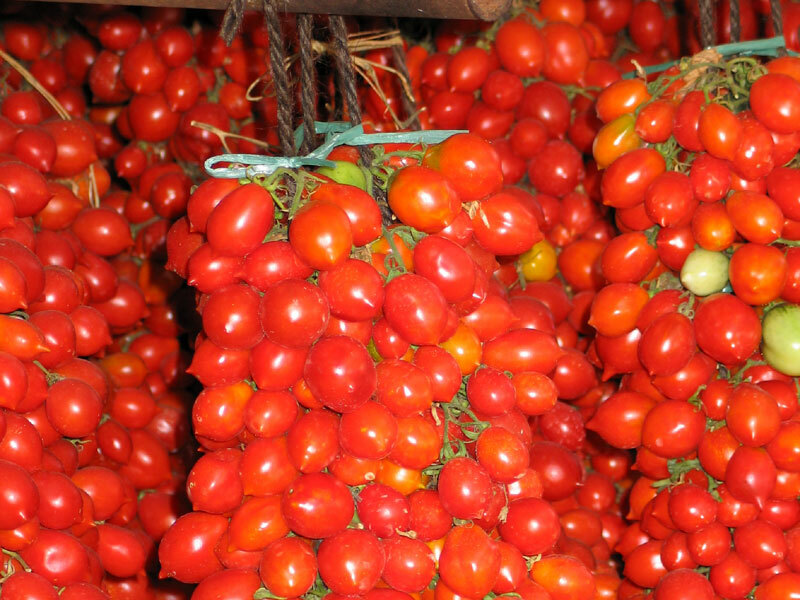 In this very particular environment, cherry tomatoes are characterized by a top quality. Pomodorino del Piennolo del Vesuvio DOP is an essential ingredient of the dishes of Naples and Campania, and can be used in many ways: from seafood spaghetti to the delicious pizza napoletana. It is harvested in summer.